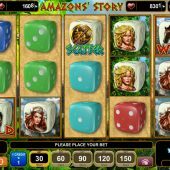 Amazons' Story slot is themed on the mythical Amazon Women, the tall striking warrior ladies from the tropical jungle. You get 30 pay lines in the usual 5x3 reel format and both 2 and 3-row stacked symbols - in fact everything is stacked in Amazonia! The sounds are very basic, just a motion noise for the reels and taps when they stop - no superfluous music here! Similar themes occur in Amazon Queen by WMS and Secrets of The Amazon by Playtech. The lush green background of river and foliage may hide many surprises for the interloper, so should we be wary? Like the trees in the Amazon, the symbols reach high and are all stacked including both scatters and Wilds. Wilds appear on all reels and award the game's best 5-of-a-kind win, at 33.3x stake. The 3 Amazonian Warriors are the best of the rest; the blonde warrior at 1.66x, the brunette at 1.5x and redhead at 1.33x stake respectively. So these appear very low but that is typical of games where a full screen of any icon is possible and they can pay over multiple lines simultaneously. There are no card symbols as the lowest pays are formed of various coloured dice, in fact these symbols are a direct copy of those in EGT's Caramel Dice slot. Typical of most EGT slots there is just one bonus spins round and the scatters appear only on the centre 3 reels. These Axe scatters are stacked too and you require 7, 8 or 9 in order to trigger 7, 15 or 30 free spins respectively. You cannot get a retrigger but the reels are enhanced with extra premium icon stacks and Wilds which usually ensure a quite profitable outcome.